Do yourself a favor and give your casual clothing a serious boost in street cred by trying some great looking Irish Linen dashiki walking suits by Royal Prestige. Royal Prestige is known by men who favor wearing real crocodile shoes because this is an upscale brand that makes their walking suits out of only the finest Irish Linen. 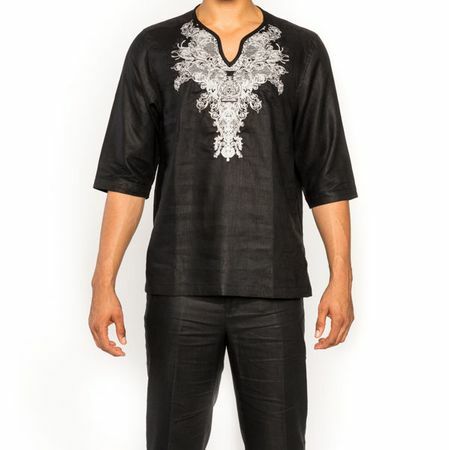 This black dashiki tunic style short sleeve walking suit features an embroidered top with open collar and solid linen pants making casual style the word of the day. Find More Mens Linen Beach Clothing Here.